I’m really starting to get into this concept they call breakfast. I love the alone time I get when I cook breakfast. No phones, no kid’s friends in and out, no noise period. I love it. I use this time to meditate, introspect and yes, pray. There is a lot on my plate right now (excuse the pun hehe) and cooking has been soothing my soul. This morning I decided to clean out the refrigerator. 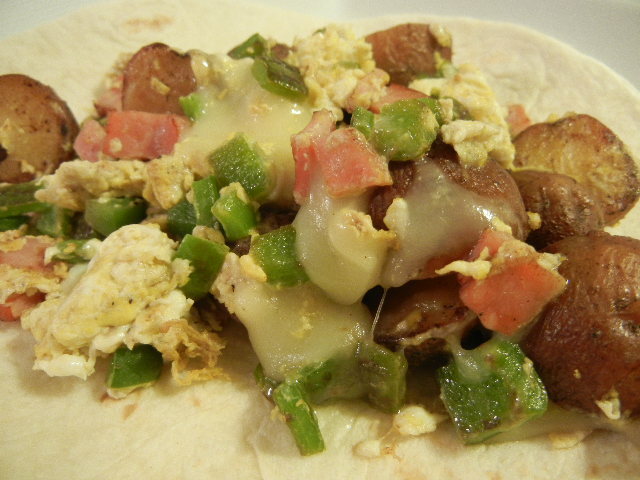 I had some left over Canadian bacon, some left over potatoes that were in my prior week’s CSA box, some mozzarella cheese, and 2 lonely tortillas. Add in some farm fresh eggs, onions and peppers from my awesome CSA box and Jeff and I had one heck of a yummy breakfast. It’s a little difficult to put measurements to this recipe since I used up what I had for left overs, but I’ll do my best. In a large skillet sautee peppers and onion in olive oil until they just start to turn soft. Add potatoes and Canadian bacon and cook until heated through. 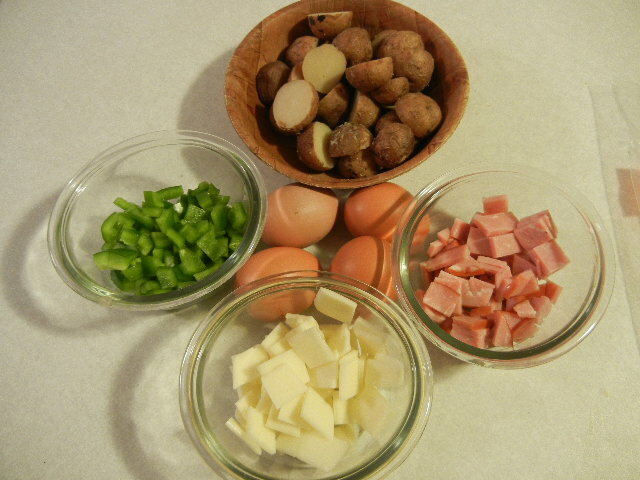 Crack eggs over ham/potatoes/veg and scramble everything together. Add cheese and toss until cheese starts to melt and eggs are cooked to your liking. Add salt and pepper. Place on top of a warm tortilla and enjoy! Breakfast. They say it’s the most important meal of the day. For years this was the meal I skipped the most. With Jeff’s recent diagnosis of the Big “C”, my days have consisted of a barrage of doctors appointments, lab tests, scans and MRIs; all while holding down a full-time job. Phew! Ironically, breakfast is the only meal I have had time for lately. All the experts that tell us to eat a good breakfast to carry you through the day are 100% right. I’ve been cooking for one in the morning. Jeff and the kids are usually sleeping. 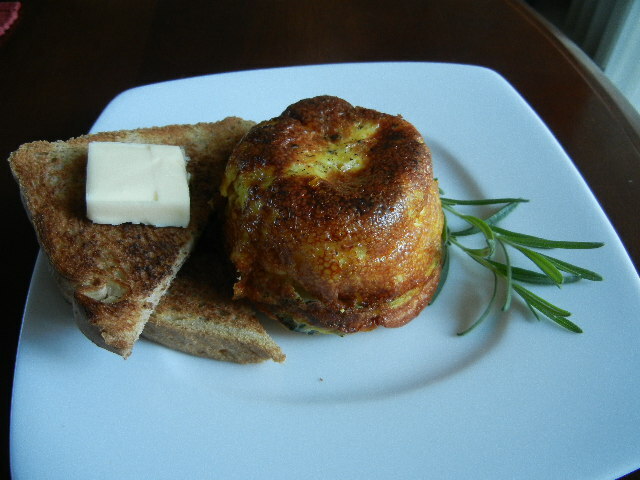 I decided to make myself some mini frittatas. They are quick and easy to make and they store well in the refrigerator or freezer. I used some of the red onion, patty pan squash and zucchini that were in my CSA box this week. I also added some greek yogurt to give it a hint of tang. They came out perfect. Spray a skillet with non stick spray and sautee the onion, patty pan and zucchini on medium high until just barely soft. Set aside to cool down a bit. In a mixing bowl mix the eggs, yogurt, chopped herbs, cheese, salt and pepper until the eggs are pale yellow and have fluffed up a bit. Add cooled veg to egg mixture and ladle into well greased ramekins or whatever smallish vessel you may have. Set on a baking sheet and bake at 400F for 35 minutes. A knife will run clear when inserted into the center. They will rise up a bit and be a gorgeous golden brown. Let cool completely. 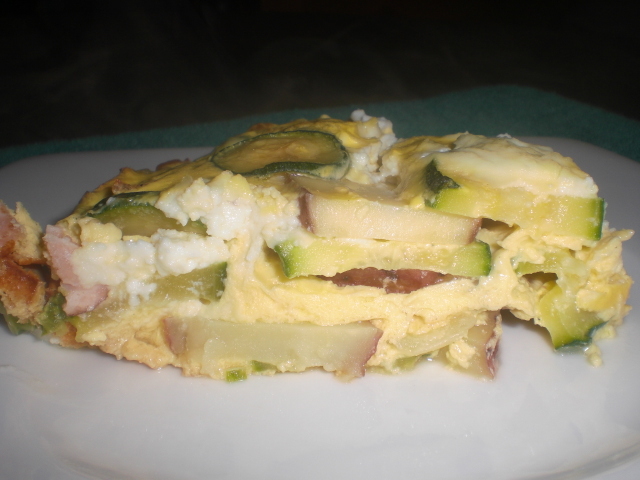 Run a butter knife along the edge of the frittata to loosen it and invert onto your plate. Garnish with whatever you like. For me it was a piece of toast and a glass of orange juice. Now, I think I am ready to face the day. 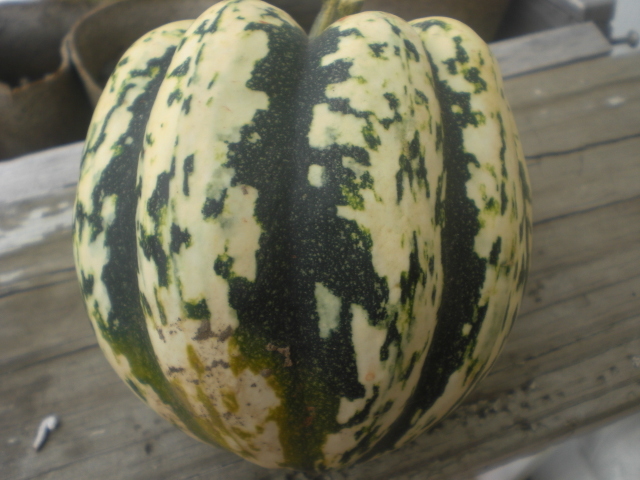 A sister of the acorn squash, the hearts of gold squash has a cream colored outside with beautiful green stripes throughout. When you cut into the squash you will find a pale flesh with a slightly sweeter taste. What to do with this beauty was the question. I decided to make a hash. And what a glorious hash it was. I used the red potatoes and onion from Highcross Farm, some bacon, fresh sage and a little bit of apple cider to bring all the fall flavors together. I topped it all off with a perfectly poached egg. Heaven. This is the quintessential Autumn breakfast. You will love it. In a medium bowl toss your diced potatoes and squash with salt, pepper, and just enough olive oil to coat. Spread onto a cookie sheet and roast in the oven for 30-40 minutes at 350. Roast until you can easily insert a knife into the center of the veg. In a large skillet brown the bacon. You want the bacon to be crispy with some chew to it. You don’t want to completely crisp the bacon. Drain off fat leaving 2 tablespoons inside the pan. Add onions and cook until translucent. Add the apple cider and deglaze the bottom of the pan bringing up the awesome bacon bits that were left at the bottom of the pan. Add the sage and roasted squash and potatoes and bacon and heat on low until completely warmed through. Top with a nice, warm poached egg and enjoy. I like my eggs runny. To me, nothing beats the silky egg yolk mixed in with the hash. Perfection. 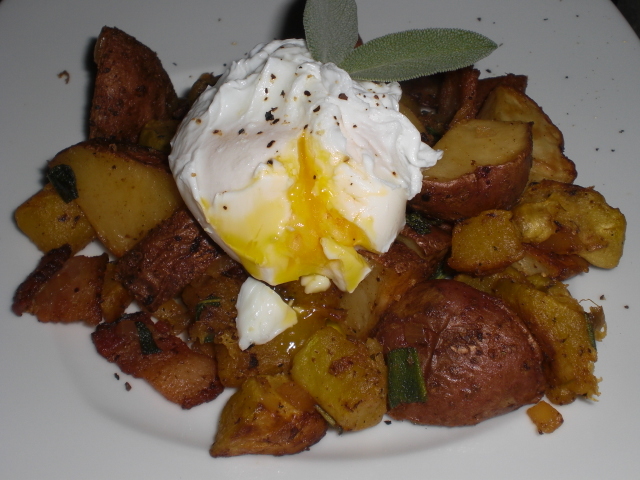 Here is a link on the best method I’ve found on how to poach an egg. Give this recipe a try on a nice chilly fall morning (or any morning for that matter). Make some toast points and a good cup of coffee and enjoy! I keep waiting for that glorious day I can quit my job and devote all my time to cooking. I guess I will keep buying those powerball tickets. With my frenzied work week schedule I find that I have to force myself to eat some kind of breakfast. Normally it’s a bowl of cereal and some fruit. But as the days get shorter and the nights eventually get colder, my body craves more sustenance. A frittata makes perfect sense. I can make it ahead of time, it’s easily to reheat, and it freezes well. I was inspired by a recipe found here. I just tweaked the recipe to suite my taste. I used the zucchini and potatoes I got from HighCross Farm because they are the best around. I had some shredded mozzarella/provolone mix on hand as well as some low-fat ricotta. This more than exceeded my expectations. 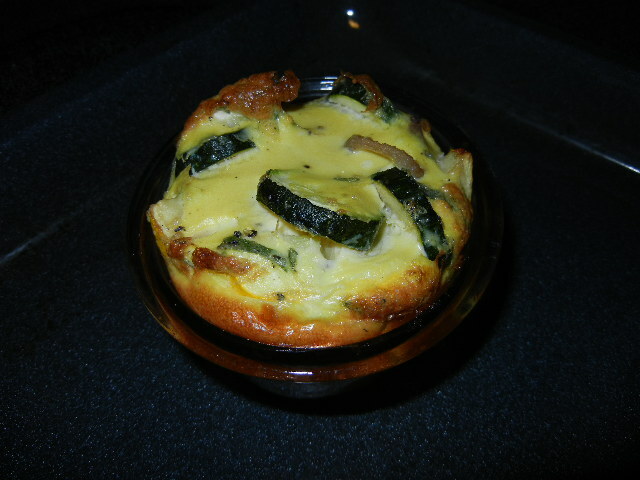 It fluffed up so nice in the oven and the potatoes and zucchini were cooked to perfection. And the ricotta, oooooooh the ricotta. When you get some ricotta in your mouth you get a bite of warm, velvety awesomeness. Combine the zucchini and 1 teaspoon salt in a colander and toss well. Set aside to drain for 30 minutes. Heat 3 tablespoons of the oil over medium-high heat in a large, well-seasoned cast-iron skillet or ovenproof nonstick skillet. Add the potatoes and onion, reduce the heat to medium-low, and cook, flipping and stirring occasionally, until the potatoes are soft, about 20 minutes. Increase the heat to medium-high and continue cooking, tossing occasionally, until the potatoes are are brown, about 5 minutes. Remove the potatoes with a slotted spoon but keep the skillet on the burner. Transfer the zucchini to a clean kitchen towel and pat dry. Add the zucchini and Canadian bacon to the skillet and sauté over medium-high heat, until the zucchini is just tender, about 4 minutes. Remove the zucchini and Canadian bacon with a slotted spoon. Keep the skillet over the heat. Beat the eggs (or add egg beaters) and pepper to taste in a medium bowl until well blended. Fold in the potatoes, zucchini and Canadian bacon, and cheese. Dollop the ricotta over the top of the frittata so you get some in every bite. Preheat the oven to 350°F. Add 1 to 2 tablespoons of the remaining oil to the skillet as needed to lightly coat the bottom. Pour in the egg mixture, reduce the heat to medium-low, and cook without stirring until the bottom is set, about 10 minutes. Transfer the skillet to the oven and bake until the top is set, 5 to 15 minutes, checking every 5 minutes. Place a serving plate on top of the skillet and carefully invert. The frittata should fall out of the pan. Cut into wedges and serve.